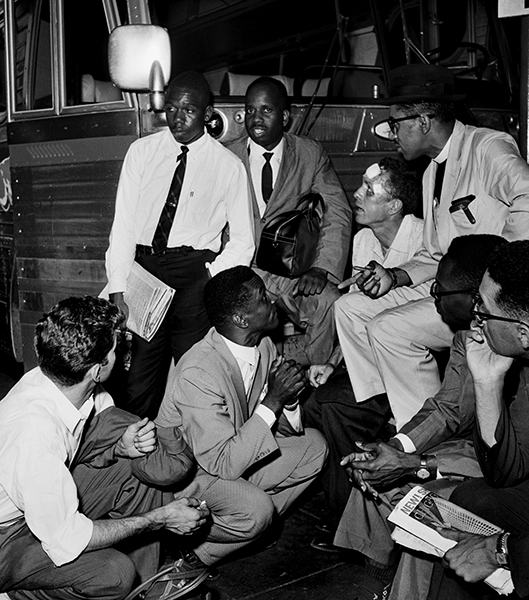 Fred Shuttlesworth, crouching center, and Freedom Riders discuss plans at the Birmingham Greyhound Terminal after drivers refused them service. Freedom Riders are, clockwise from left: Ed Blankenheim (kneeling), Charles Person, Theodore Gaffney, James Peck, Rev. Benjamin Cox, Moses Newson, and Simeon Booker.